Hohulin offers quality commercial gates with superior strength and beauty to our Central Illinois customers. With the material options of wood, vinyl, iron and chain-link, our commercial gates can match any type of fencing structure. Our craftsmen install gates of any size and specifications to fit your unique fencing needs. So whether you are designing an entirely new fencing system or simply improving an existing structure, Hohulin is the right choice in commercial gates and operators. 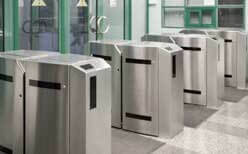 We offer full-height turnstiles in a galvanized finish. Can integrate any type of card reader access or biometric system. Available in any combination of fail-lock or fail-safe on electric versions: All fail-lock applications include a mechanical release key to allow manual override in an emergency. Heavy-duty mechanism can be mechanical with optional self-centering or electrical with standard self-centering. Three rotor sections for 120-degrees of passage space allow for greater comfort in use. Bottom thrust bearing is dust and moisture proof. Low voltage, 24 VDC operating system requires normally open, momentary, dry contact to release turnstile gate. For more details, please visit http://www.boonedam.us/turnstile. 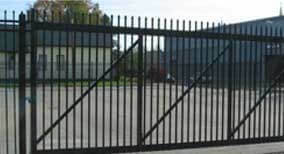 Hohulin Fence installs and maintains electric gate operators for all types of commercial gates. For over 20 years, we have supplied Linear Osco gate operators because of their dependability in powered gate applications. We offer Linear Osco commercial gate operators in several different voltage and phase configurations. Electric gate operators can be installed on new installations and also as an aftermarket addition. Hohulin also provides maintenance for existing commercial gate operators. We stock many common replacement parts and access controls. Click here for Linear styles and colors. Choose Hohulin for Your Commercial Gates and Operators! Contact us online or call us at 309-316-1008 for your commercial gates and operators today! For other commercial fencing products, visit the following: Chain Link Fences & Athletic Fencing, Ornamental Fencing, Rental Panels, Privacy Fencing, Commercial Kennels, Highway Guard Rails, and Commercial Railings.